Of course each product is different and the decision to use customized or standard components has to be made based on a series of considerations. For example, is one of the specifications you’re looking for a nice-to-have, or is it a critical aspect of the product? Are there suppliers that have the specific knowledge and experience to execute on the critical specification? Can overall parts count be reduced by the process of customization? What is the minimum number of units required to make this interesting to a supplier? 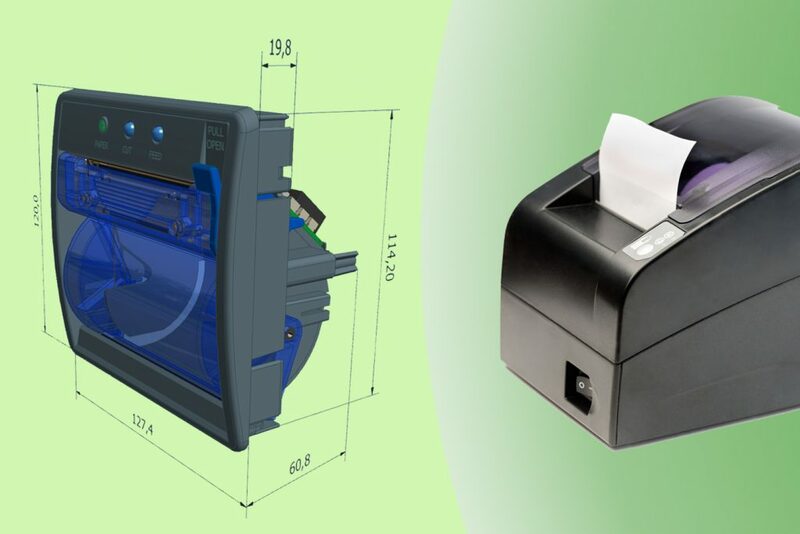 An “integrated” product today most likely has a shell with molded supports for the various OEM components that perform its functions in which the thermal printer will normally be standard, “off-the-shelf”. During production the printer finds ready molded supports in the external casing and is quickly assembled and connected. Designers of the smaller the products, or products with public user interaction, may find they are challenged to provide the “user experience” they desire with standard printers: the “off-the-shelf” components they have reviewed, although readily available, are bulky to design around or difficult to place in a product without making it awkward or aesthetically displeasing. If the latter is true, you’ll consider exchanging the advantages of standard, high volume printers (e.g., proven reliability, market availability and faster delivery) with custom printers, either by integrating component parts into your design or having a supplier partner with you to design a printer to your specific spatial and technical specifications. In his experience, Giacomo Caserini, Director of KFI’s Custom Printer division in Italy (KFI designs and manufactures printers for MedTech, Kiosk, industrial and Voting Machines) confirms that aside the obvious of performance, personalization, “design” and external appearance, the biggest motivator that companies turn to KFI for custom printers is cost savings, even on production runs in the low thousands. Sure, he says, because the process of customization includes the elimination of unneeded material and often includes new or lateral functionality pushing down the overall product cost. This is in line with Eric Leclair’s findings. In fact firms save on design time with suppliers of custom devices working closely with their customer’s designers and engineers, working out the design wrinkles for them. Still more importantly, working with suppliers engineering teams, customers find a lower overall component count in their bill of materials because in many cases they can push other functionality into the custom solution or remove redundant enclosure extrusions through full integration of peripheral into their product. One concern regarding custom printers and custom designed components in general, is supply during the whole of a firm’s product cycle. There is of course a case to be made for “standardization” of a product’s components in that because the component is available to multiple firms, possibly across multiple vertical applications, availability of the component (and pricing) is guaranteed, potentially, for years to come. Suppliers of standard components typically give extensive lead times before changing or obsoleting a component. However, companies and suppliers of custom printers can often get around this problem contractually with co-ownership of a specific design and any associated molds so that companies can duplicate or move production after the initial contract expires. And when considering custom solutions, companies must foresee longer lead times for delivery. Smaller custom printer suppliers, like KFI, focus on agility and turn time to support their customers product cycle: they must provide physical models (3D printed) early on, followed quickly by a limited series of functional models that will keep companies’ engineers and designers from stalling in their own product design and prototyping.